Good Garage Scheme Car Servicing in Great Britain : Good Garage Scheme hears of Volvo's ambitious plans to exceed its own reputation. Good Garage Scheme hears of Volvo's ambitious plans to exceed its own reputation. The World Health Organisation estimates that 1.2 million people are killed and more than 50 million wounded in road accidents annually. Jan Ivarsson, Volvo's head of safety strategy has revealed bold targets to reduce this catastrophic total. He said: "Our aim is to build cars that do not crash. 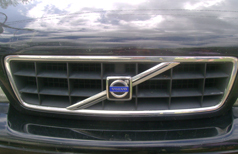 By 2020 no one should be killed or even moderately injured in a Volvo." In short they want to build an “uncrashable” car. Volvo have been groundbreaking in safety developments for decades with innovations like anti-lock brake systems, three-point seatbelts and collapsible steering columns. Therefore, what car manufacturer is better placed to take on this challenge, given that they have been gathering real-life accident data since the early 1970s, collecting information on over forty thousand mishaps involving over sixty thousand vehicles? In 2008, an EU-funded initiative was launched which would be carried out during 2010. Through a multitude of sensors and other data sources on both vehicles and drivers of a fleet of a hundred vehicles, Volvo's crash safety researchers would have volumes of data available for analysis. The Volvo team, while enthusiastic and confident of their ability to pull this off, retain an air of realism in the face of a daunting task. Jan Ivarsson added "We need to encourage better skills, better habits and better attitudes.” Attentive, active drivers are absolutely necessary if we are to achieve our goal of zero accidents."